The list is based on "measured media" spending across 19 media and includes estimates of "unmeasured media," which includes direct marketing, product placement, and most notably, paid Internet search, which some analysts estimate is about 40% of the ***total ad spend** [CORRECTION: **total Internet ad spend**] of companies in general. New to the list this year is Boehringer Ingelheim, which markets Mirapex for Restless Leg Syndrome in competition with GSK's Requip. The total spend for these 13 pharma companies in 2007 was $6,998,700,000 measured vs. and estimated $6,834,600,000 unmeasured. That represents 13.1% of the total spending in 2007 of the entire group. NOTE: Not all of this represents direct-to-consumer (DTC) advertising. Magazines, for example, include B-2-B publications (ie, medical journals focused on physicians). Based on these data, the top spending pharma companies have a media mix distinctly different from the top non-pharma companies. Pharma devotes a greater slice of its advertising pie to TV and magazines than do non-pharma companies. In fact, 92% of pharma's budget is devoted to these two categories of media! That leaves scant dollars for other media. 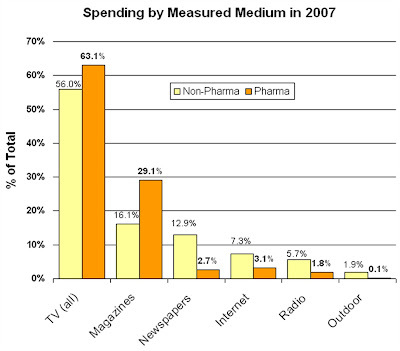 It makes sense that pharma would not spend as large a portion of its ad budget on newspapers, radio, and outdoor venues. These media focus on local markets rather than mass markets and pharma has little need to tailor their messages to local markets (although some drug categories may benefit from more exposure in communities with disproportionate medical problems, such as diabetes in African-American neighborhoods). But it is surprising that pharmaceutical companies -- at least the 13 in this group of top spenders -- devotes only 3.1% of their ad budgets on the Internet whereas non-pharmaceutical companies devote 7.3% of their budgets to the Internet. I believe that most pharmaceutical marketers have a mass-market mentality and do not view the Internet as a mass market medium. Every defense I've heard from these marketers for why they are not spending much on the Internet includes the phrase "lack of reach" in comparison to TV and magazines. True enough. Also, the Internet is not nearly as motivating as TV in getting consumers to visit their doctors and ask for a specific brand of drug, which is the goal of all direct-to-consumer pharmaceutical advertising. Not until the Internet, in the minds of pharmaceutical marketers, becomes more like TV, will the needle move on pharma Internet-based DTC advertising. But guess what! The Internet is becoming much more like TV because of Rich Media, which includes streaming audio video (eg, podcasts), animations and other programs that engage viewers like TV does, but also allows them to interact with the advertisement in ways that are not possible with TV. More and more, I have seen pharmaceutical Web sites that embed videos of their latest TV ads. Some have even solicited consumer-generated videos for submission to YouTube. I've been experimenting myself with rich media -- see "Blogs are Done! What’s Next for Pharma Marketing?". My most recent endeavor in this area is what I call a Vendor Video Showcase that I introduced at my June 4, 2008 Networking Dinner Reception. For some time I have maintained an online directory of pharmaceutical vendors, solution providers, and consultants over at the Pharma Marketing Network portal (see www.vendors.pharma-mkting.com). Up until now it was your typical static, Yellow pages type listing with text, maybe a graphical logo and links to the advertiser's Web site. The text included a short 150-250 word "pitch" for why pharmaceutical companies should hire the company in the listing. Very standard stuff. Not terribly engaging and it doesn't give you a feel for the people who run the company. The Vendor Video Showcase is a new and exciting promotional option for the directory that helps overcome this limitation. It features an embedded video "sales pitch" included in the listing in which a company representative -- the CEO is best -- makes a 1-minute presentation about the company and what it has to offer. To see this in action, please visit the Consultants, Management/Strategy page of the directory and listen to Jan Heybroek, President of The Arcas Group. Jan's video pitch was recorded live at the networking dinner. Aside from the video embedded in the listing, what's neat about this is that the video is also posted to my YouTube Channel where people -- eg, current and former clients of The Arcas Group -- can post comments (eg, testimonials) and rate the video. Just like pharma companies, however, advertisers may consider these "social media" aspects a double-edged sword. There is always the option to turn these functions off or to moderate comments before publishing them. The other advantage of housing the videos on YouTube is that they can be found by a Google search, which adds to the utility. Pharma Marketing Network’s Vendor Video Showcase is the first online pharmaceutical marketing directory to offer rich media options. To learn more about this service, download the Vendor Video Showcase Fact Sheet (pdf file). This article ( http://seekingalpha.com/article/79615-failure-to-deliver-meaningful-roi-online-for-pharma)clearly explains why Pharma lags in the online ad spending category and its not because they only have a "mass market mentality" as you suggest. Its because unlike those other channels the ROI in online is either negative or impossible to measure. After all, if the ROI of online were clear, obvious, and high why wouldnt they spend more there? While it may be true that online ROI is difficult to measure, I would contend that it is even MORE difficult to measure ROI from mass market TV advertising! Effectiveness of THAT medium depends upon surrogate endpoints -- like focus groups -- whereas direct metrics are available for online campaigns.